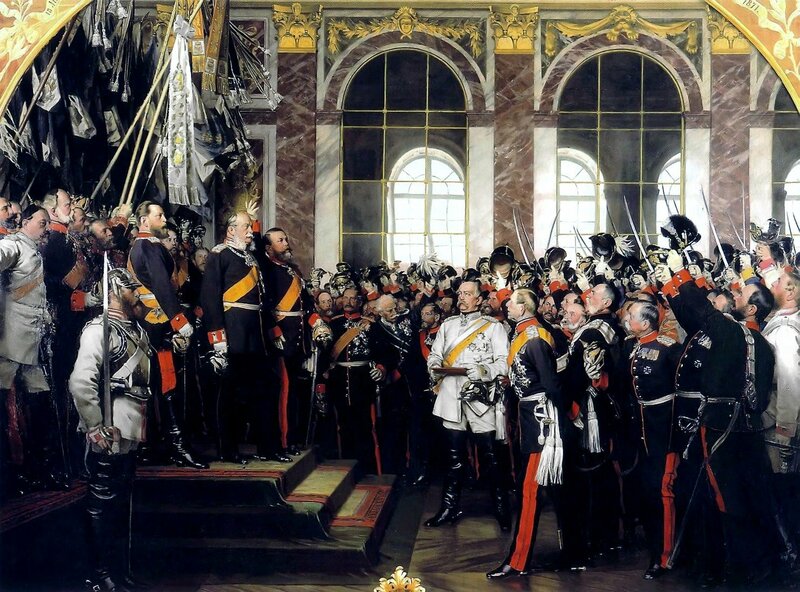 The Kaiserzeit, the time of the emperors began with the unification of Germany under Kaiser Wilhelm I. Prussia under the guidance of the genius of Otto von Bismarck united the German states against their arch enemy, the French. In so doing he united the German states into one. Creating a super state out of thin air, one day central Europe was divided in duchies and kingdoms. The next it was all one empire under one emperor. It was to be a Reich to last a thousand years. This super state had carried on under Otto von Bismarck in a time of peace and prosperity. 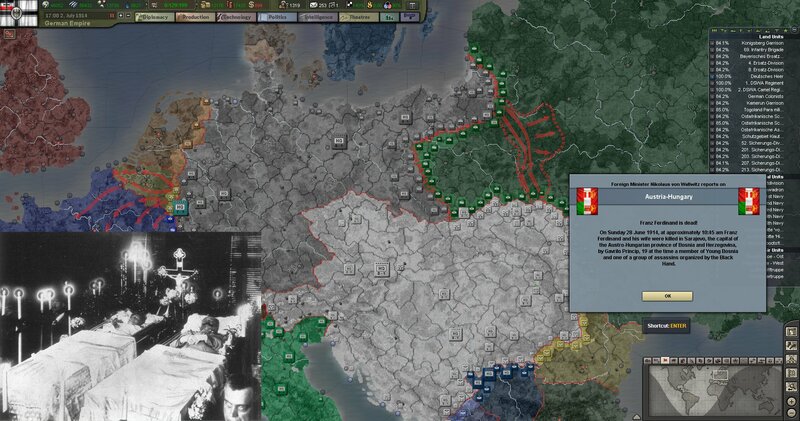 France was isolated from the rest of the world unable to find support for her demands for Elsaß-Lothringen. However it was not to last. 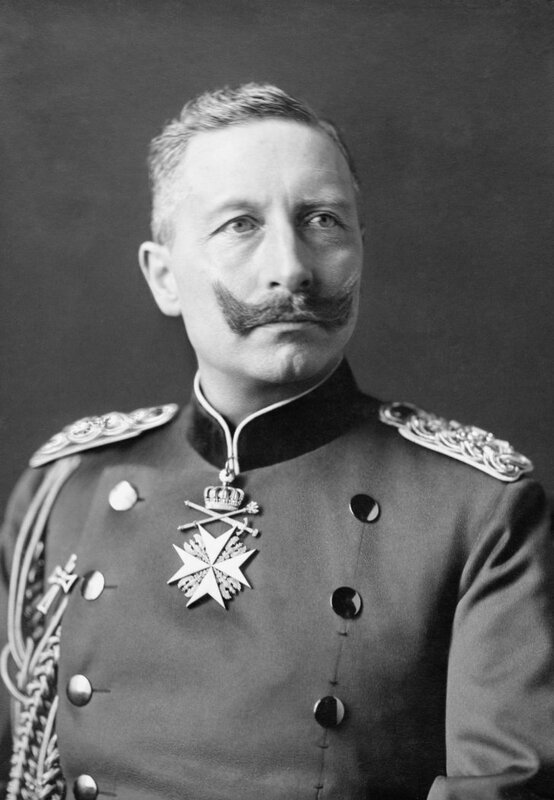 The death of Kaiser Wilhelm and then Fredrick III lead to the succession of Kaiser Wilhelm II. 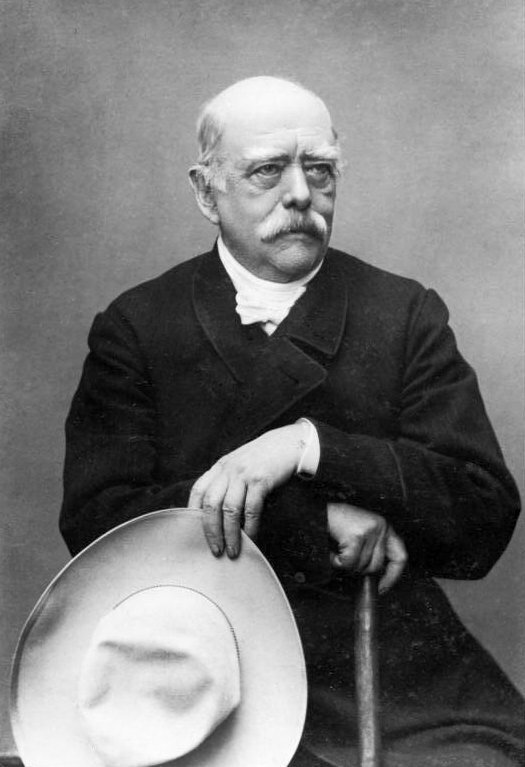 A young man plagued with insecurity he chafed under Otto von Bismarck and only two years into his reign he forced him to resign and with it the path to war was set. By 1914 the world was practically on fire. In Mexico a full scale American intervention was on the hunt for a terrorist, China was boiling with dissent and in the Balkans two wars had been fought in the last few years, reshaping the power balance in the area. Germany had done her part in fanning the flames. In 1911 the Agadir crisis had almost pulled the world into a war and the enormous fleet expansion had antagonized Britain. As such in 1914 Germany was surrounded, in the west France, in the east Russia and to the north-west Great Britain. 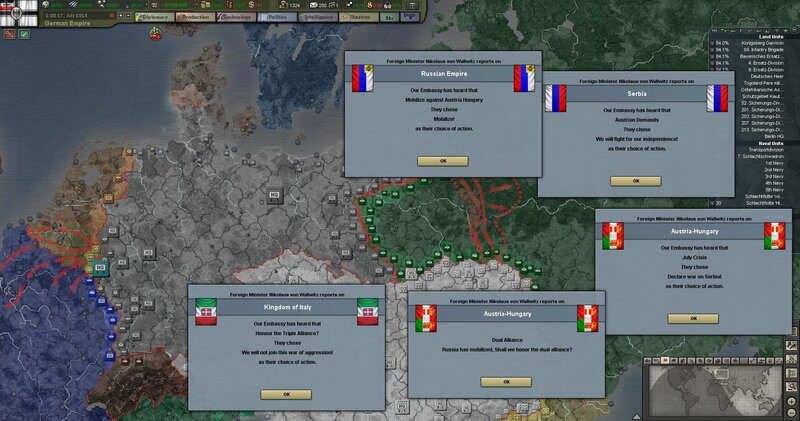 Only the southern flank was safe with Austro-Hungary and Italy as allies. Yet to face this precarious situation Germany had at her disposal the best officer core in the world. 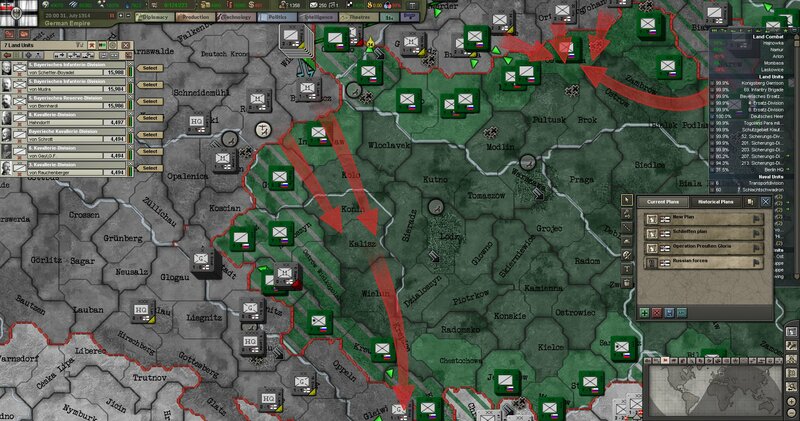 In the east they had drawn up an ambitious plan to surround Russian Poland and in so doing trap 50 divisions. In the west the plan was the ever ambitious Schlieffen plan. 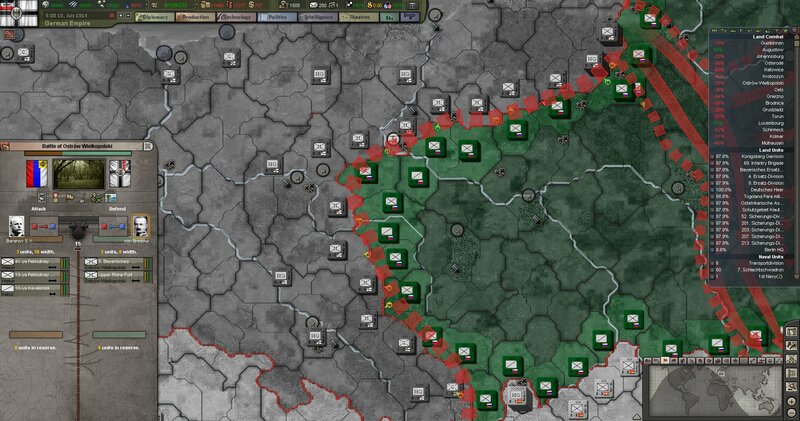 Modified, it still called for a strong right wing to smash through Belgium towards Paris while a small force holds Elsaß-Lothringen. 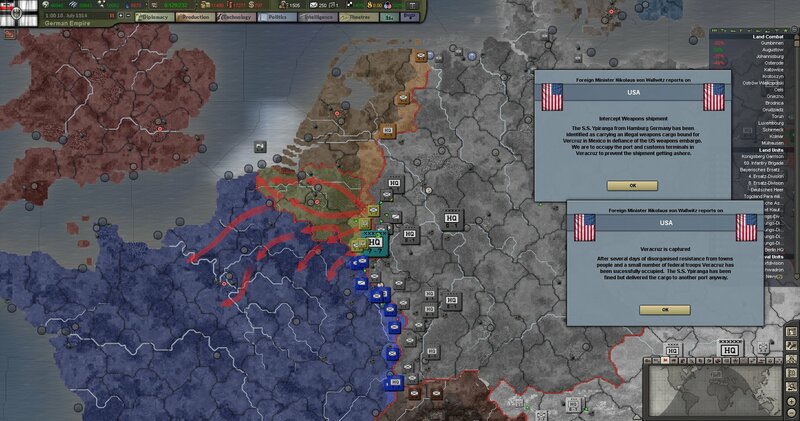 Belgium would be crushed in a week allowing our troops to rush towards Paris and thus forcing a French surrender. 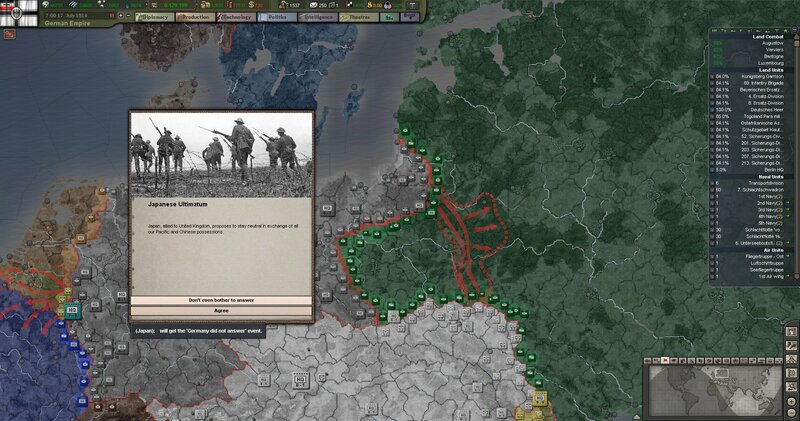 The large scale reorganization of the Deutsches Heer that took place in 1914 has left 560 000 men in the east which will rise to 620 000 after mobilization. 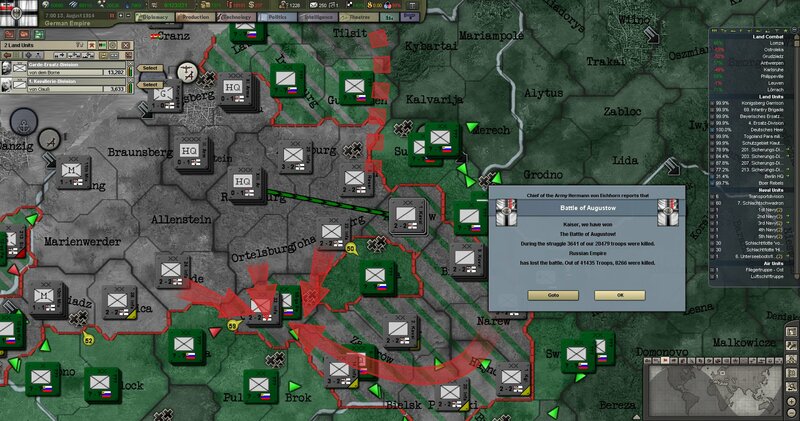 However with half of the divisions being Landwehr or Cavalry, it is also weak in artillery only having 19 brigades. 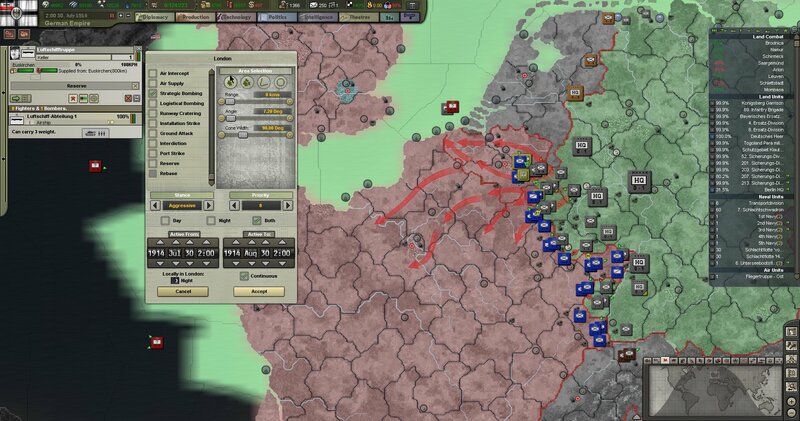 But in the west the main part of the German army is gathered, 800.000 men with 42 artillery brigades, 17 being heavy artillery stand ready to smash into Belgium. To their south 130 000 which will rise to 200 000 are ready to defend Elsaß-Lothringen. We will remember the words of Schlieffen; we will keep the right wing very strong! On the 28th of June the drop that would make the cup spill came. Franz Ferdinand the heir to the Austro-Hungarian Empire was assassinated by Serbian nationalists. It can come as no surprise that the Austro-Hungarians want to hunt this terrorist and all his friends down. Germany of course is fully behind her ally whatever happens. A loving father and mother go the heavens. They leave behind three children ages 13 to 10. 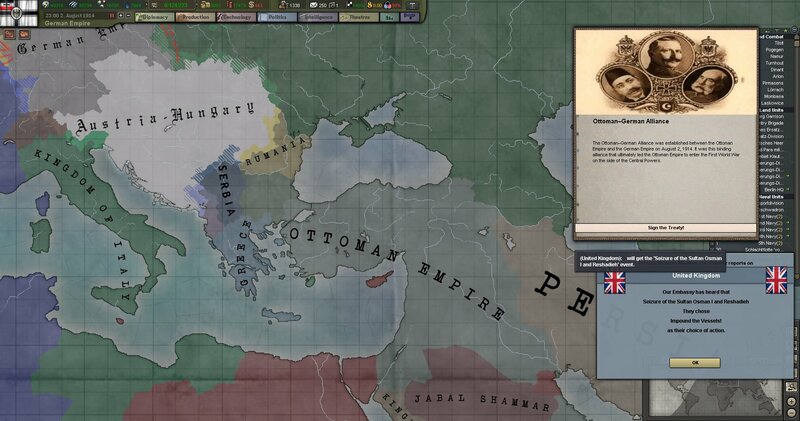 Franz Ferdinand's last words echo throughout the world "Sophie! Don't die! Live for our children!" Yet the world cares little for the price of terrorism Russia quickly backs the terrorists in Belgrade and Italy abandons her duty to her allies declaring herself neutral. The war has begun and Russia has mobilized. There is no time to lose! On the 17th of July the Schlieffen plan is activated, millions of men begin their advance. May god have mercy on us all. Following the declaration of war the Kaiserliche Marine sends out the brand new sub marines. These ships can hide beneath the waves before suddenly jumping out to attack. Britain may have the largest fleet in the world but it cannot sink what it cannot see. 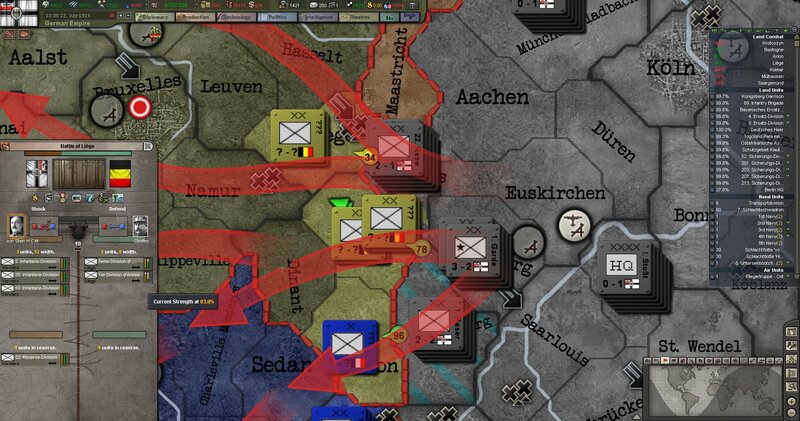 Like a wave of Krupp steel we smash into the chocolate soldiers in Belgium. They resist for a few hours before retreating in disarray. The Americans have trouble occupying a small town. We get 800.000 men marching in unison within a day. America truly is the laughing stock of the world. The first of some very disturbing news have started to roll in on the 18th of July. 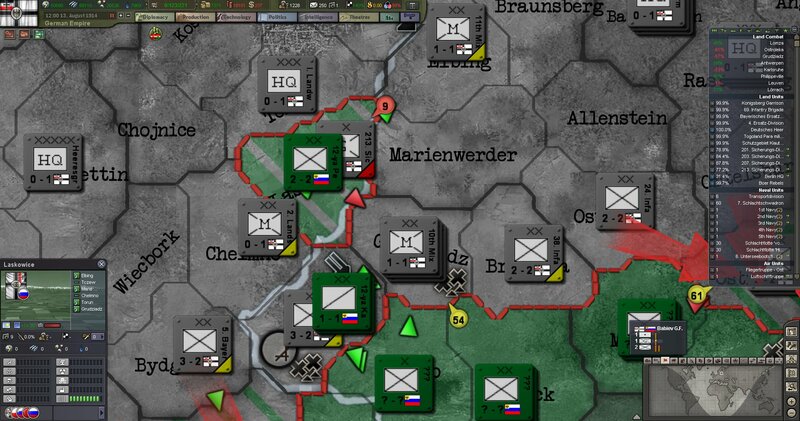 The Russians who we assumed would take some time to prepare for any offensive action is already launching themselves at the poorly equipped Landwehr Armee. Hold fast, defend the fatherland! 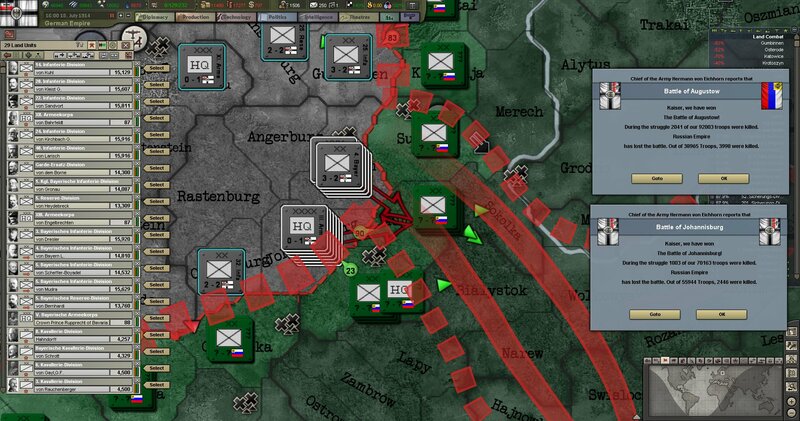 We break the Russian line in the east at Augustow. 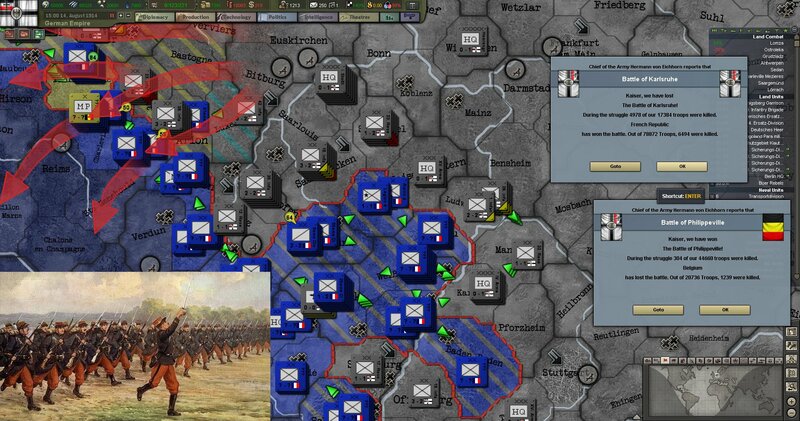 Yet the poor reserve divisions defending Elsaß-Lothringen are not so lucky, facing enormous artillery barrages they are forced back with heavy loss of life. Yet they must make do, the right wing must remain strong! 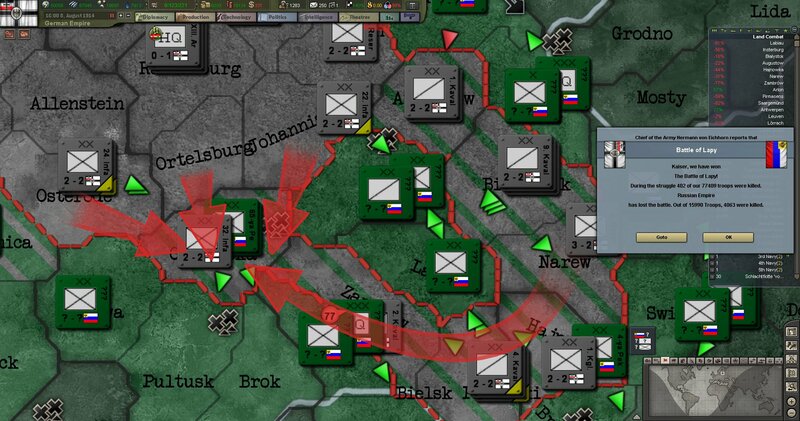 Disaster, the Russians are entering Silesia the huge hordes of Russian soldiers mobilized far quicker than anyone could imagine. Somehow we must hold them back. They enter Prussia from the south. 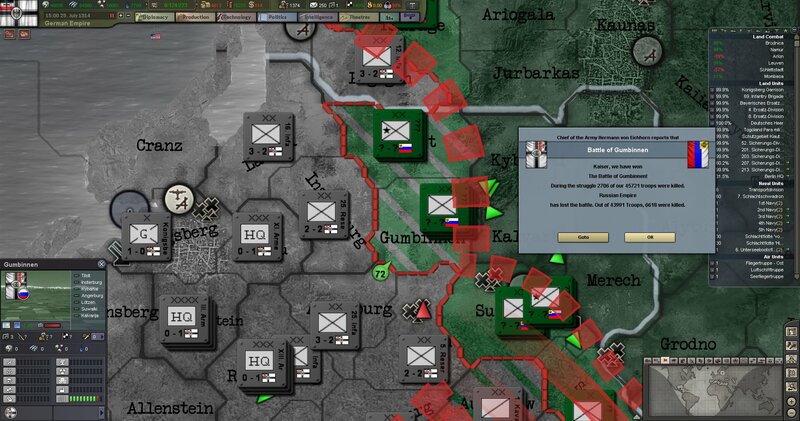 It is clear that the under equipped Landwehr cannot hold back the Russians hordes. 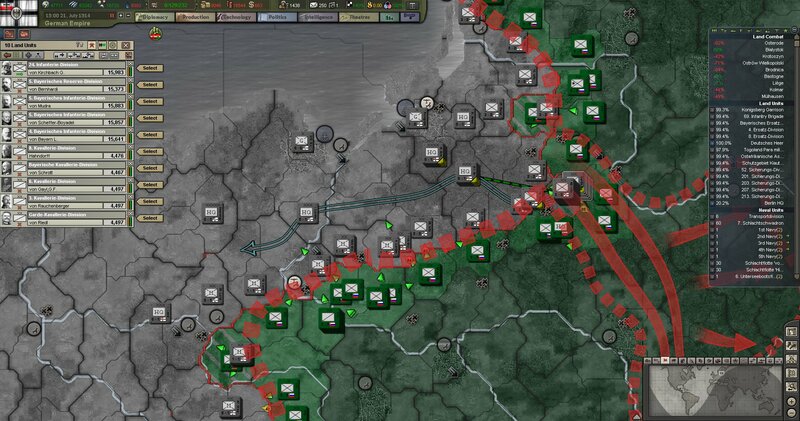 The hopes for a large encirclement must be abandoned. 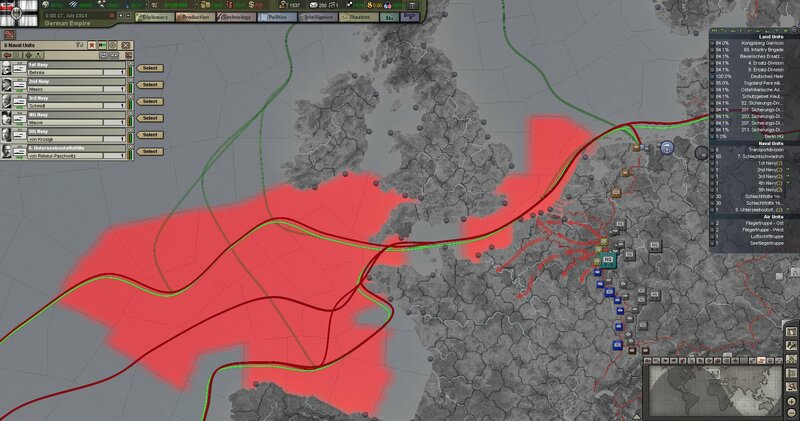 We must survive in the east while our troops in the west knock out the French. 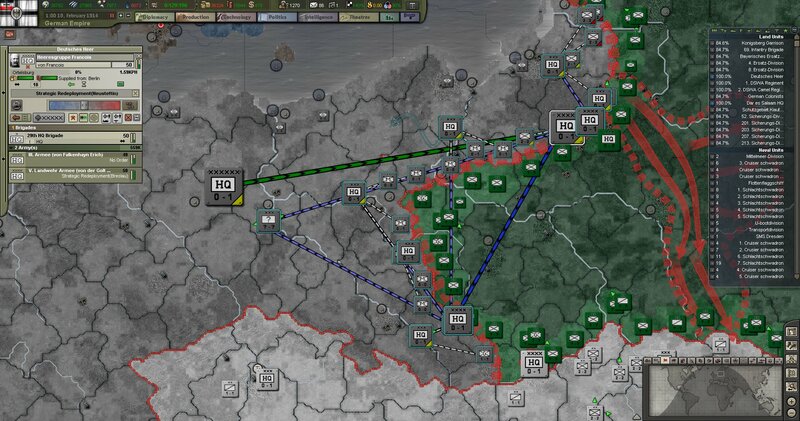 Everything is taken to protect Silesia. 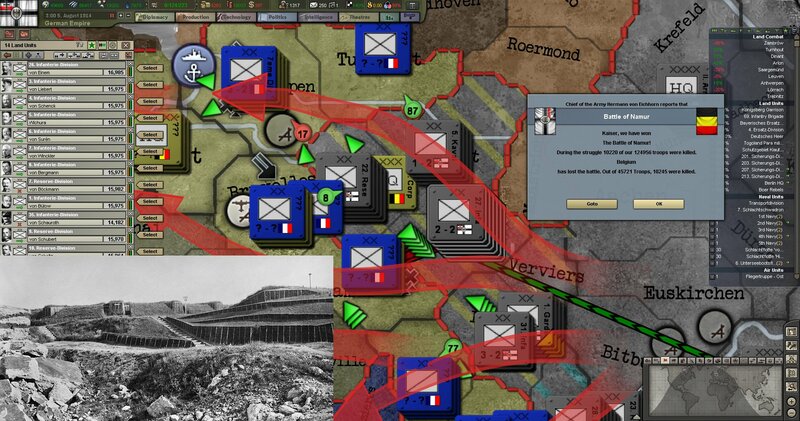 The so called “chocolate soldiers” are proving rather tenacious in the defense of Liège. They are stealing precious hours we cannot afford to lose. 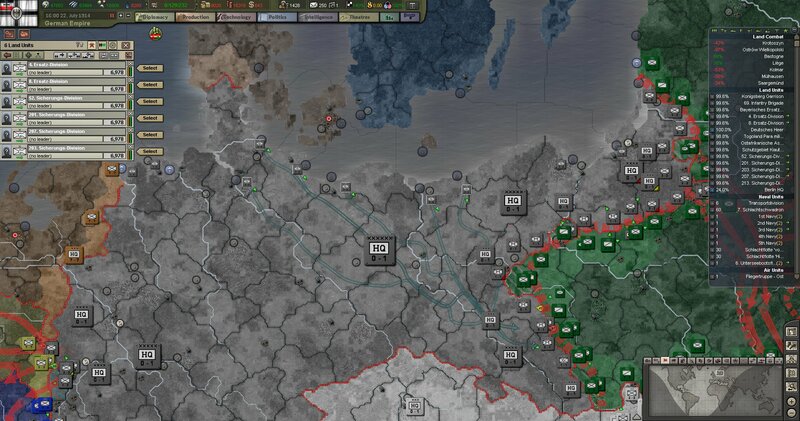 Every hour we spend fighting Belgians is an hour the Russians get closer to Berlin. The line in Elsaß-Lothringen clearly cannot hold. 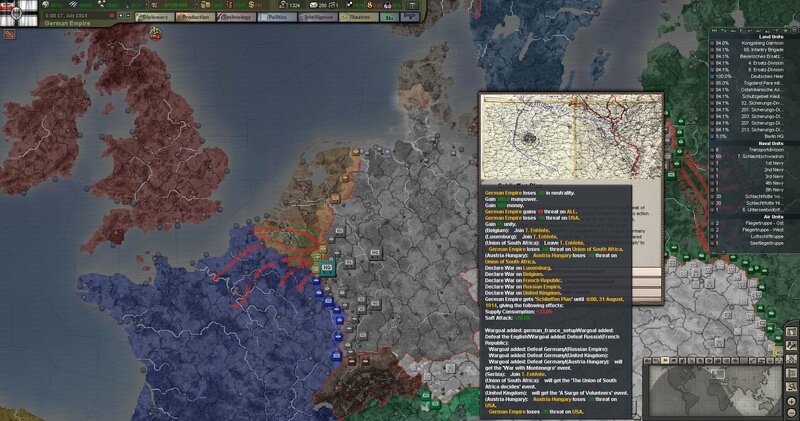 A single corps is sent to provide support, 80.000 men gone from the right wing and the rush towards Paris. We bleed for every inch of East Prussia. 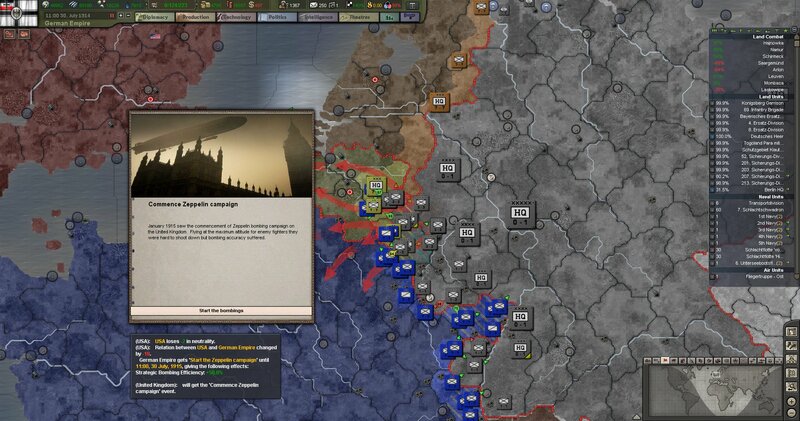 In Belgium Liège finally falls to our troops and now only the fort at Namur remains. 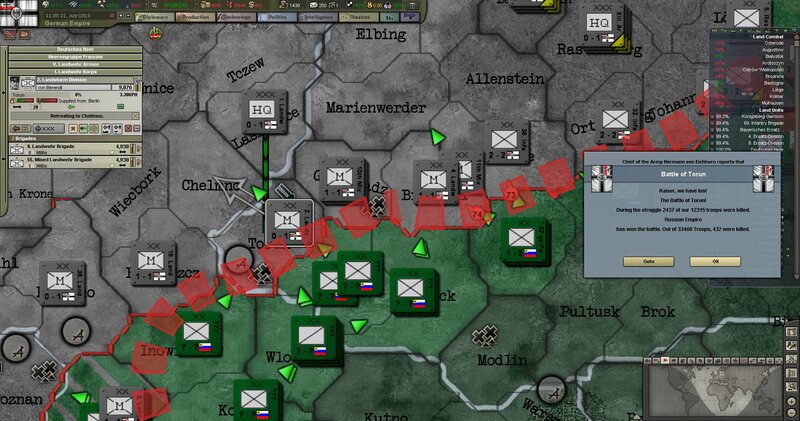 In a display of German superiority our troops wait for the Russians to overextend as they rush into Prussia. 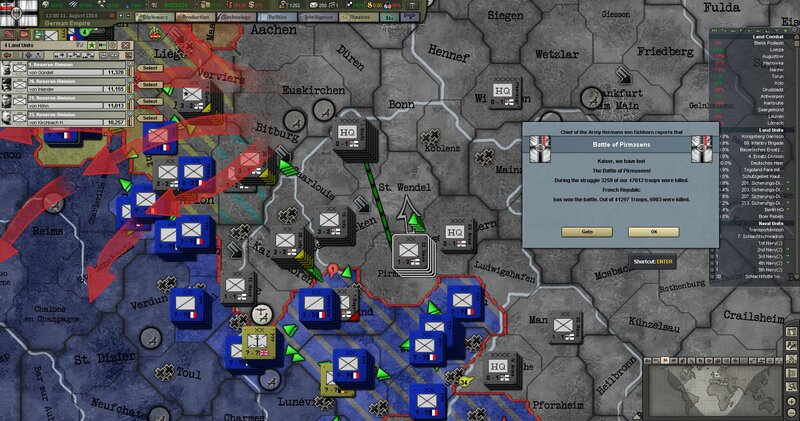 They are greeted by an artillery barrage and German steel. We quickly drive them back out of the fatherland. 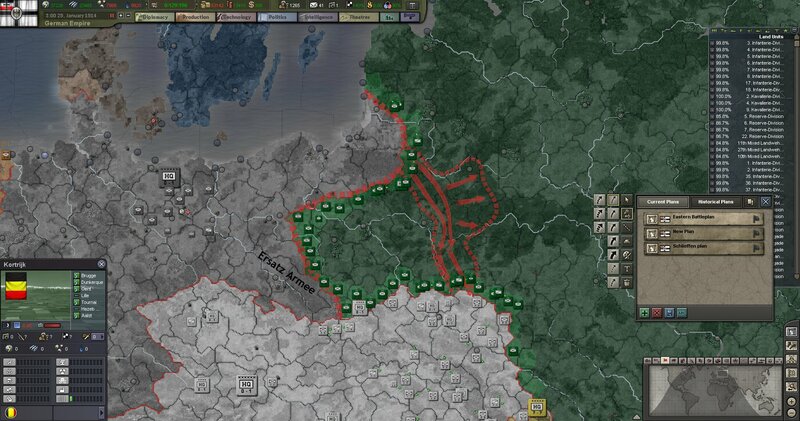 Francois vows to hold every inch of East Prussia. Understandable as it is his homeland. 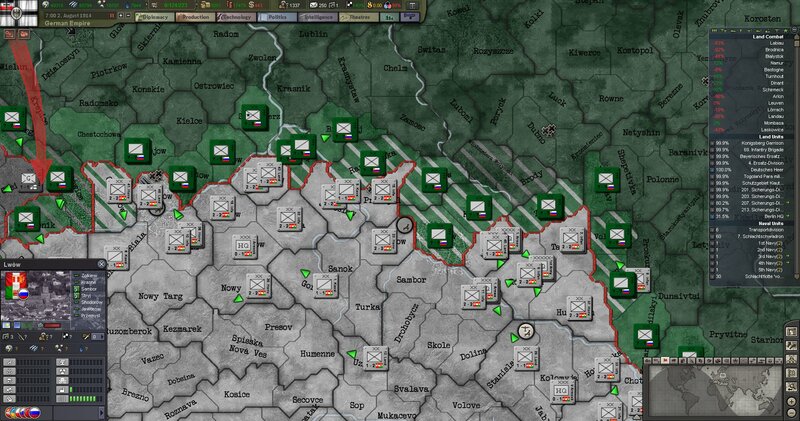 In the south meanwhile the Austro-Hungarians are proving inept as they give ground to the Serbs! Everything will be put to use in this war. Everyone is a soldier in this war. There are no civilians. The Arrival of our reinforcements leaves us with strong troop concentrations on the northern and southern side of Elsaß-Lothringen. 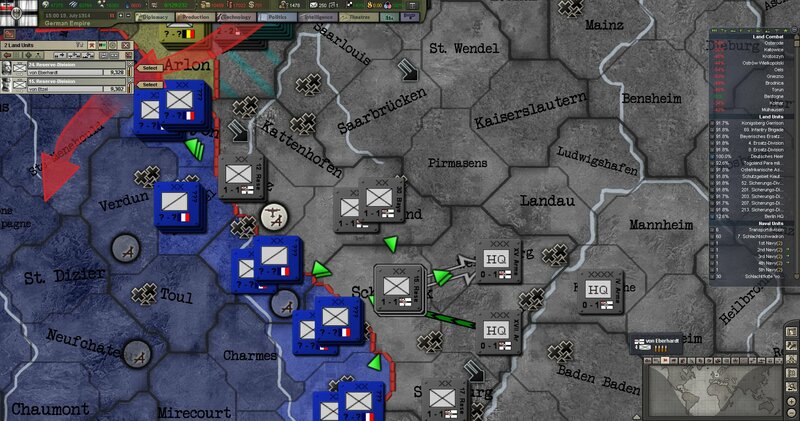 So we attack into Schirmeck, the connection point to the French advance deep into Elsaß-Lothringen and drive them out in a bloody battle. It is clear that in the east the Russians are far beyond what we expected. Whoever was in charge of drawing up plans was an ambitious madman. The Russians have far more troops than us that are also of higher quality. 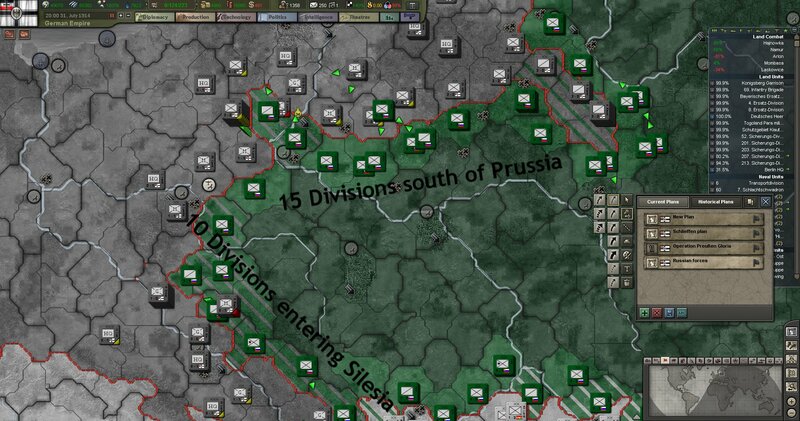 10 divisions are pushing into Silesia while another 15 threaten Prussia from the south and yet another 10 divisions threaten East Prussia from Lithuania. However an ambitious man has put forth great plans and Falkenhayn, the general of the III. Armee based in Prussia agrees with him. Whoever this “Advisor” as he calls himself is he is just as crazed as the last guy. 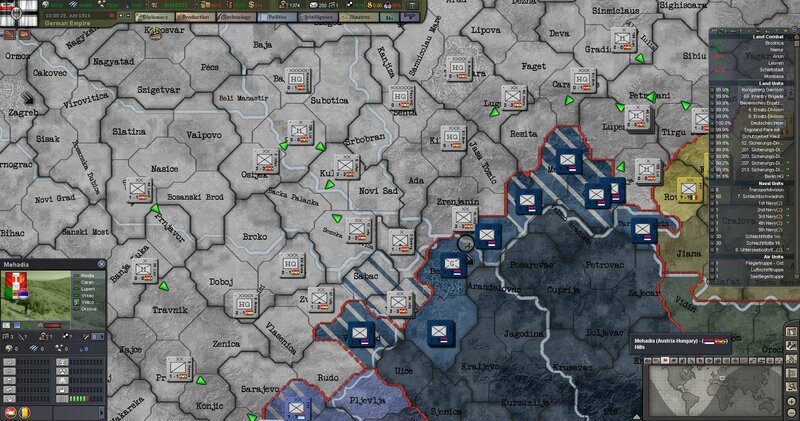 Yet the panicked state of the eastern front means Falkenhayn finds it easy to continue on with his plan. “I will not plan for defeat, I will not plan for a stalemate, I will plan for victory! Victory in the east! Falkenhayn, 1914 on “his” planned offensive. In Galicia the Russians enter Lwów on the 2. of August. 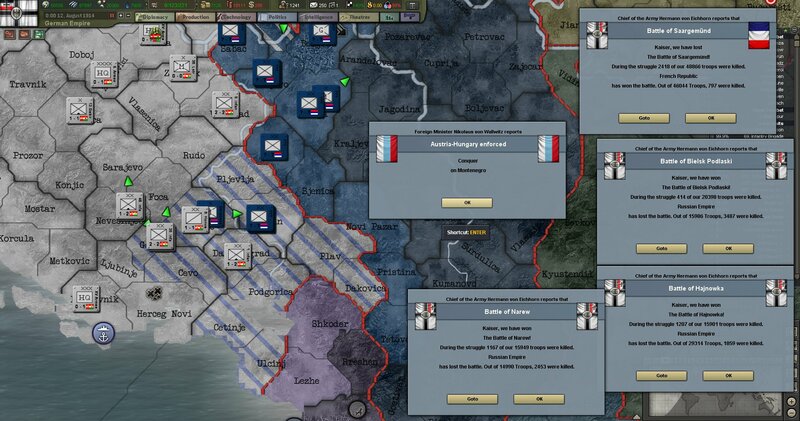 The Austro-Hungarian army is in disarray. If only we had men to spare to aid them. The British steal from the weak and thus sends another friend our way. 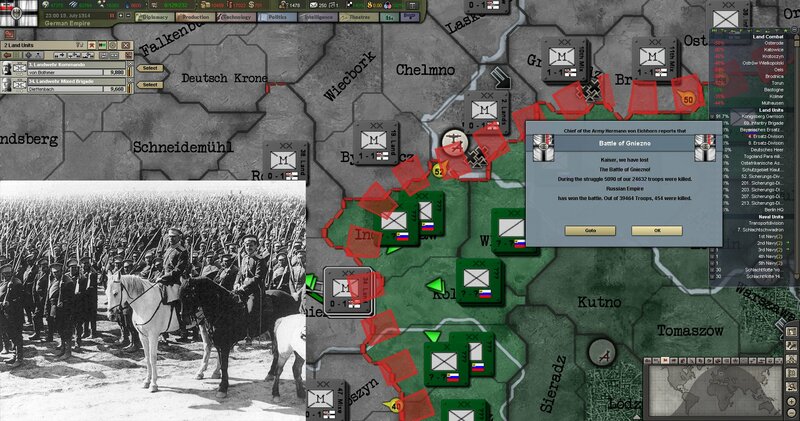 More of East Prussia is given up as troops are needed for the offensive much to the anger of Francois. The bloody battle of Namur finally comes to an end as our troops destroy the last wretched fort that has ruined our timetables. The Belgians will pay for this. 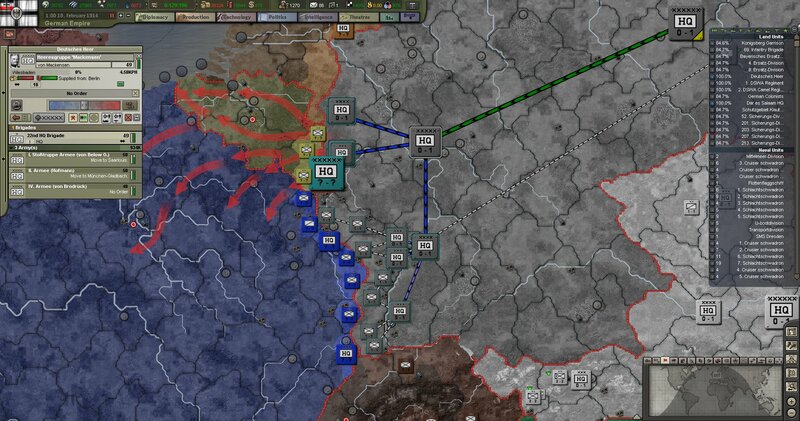 The situation in Elsaß-Lothringen is growing ever more desperate. 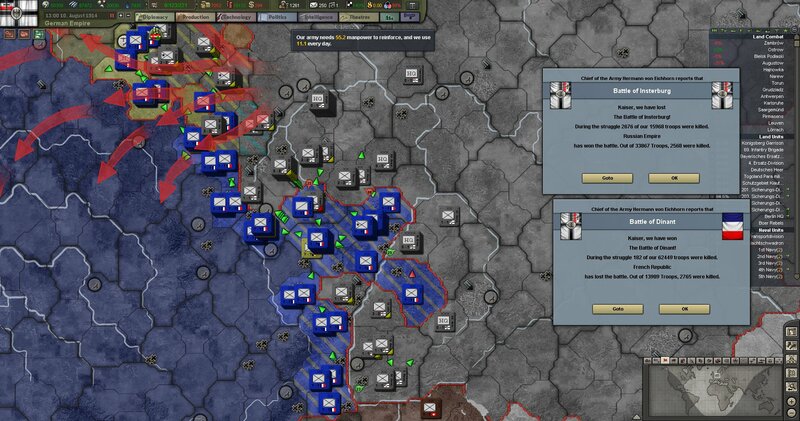 Another 80.000 men are pulled down into the pointless inferno, away from Paris and away from victory. Yet in the east the plan from the Advisor has proven remarkably effective. Tens of thousands of Russians are trapped and rounded up. In his report to high command he just said it was like “old times”. Considering this is our first war with the Russians in hundreds of years we are not sure what he means. Even so the man wins victories so what does it matter? 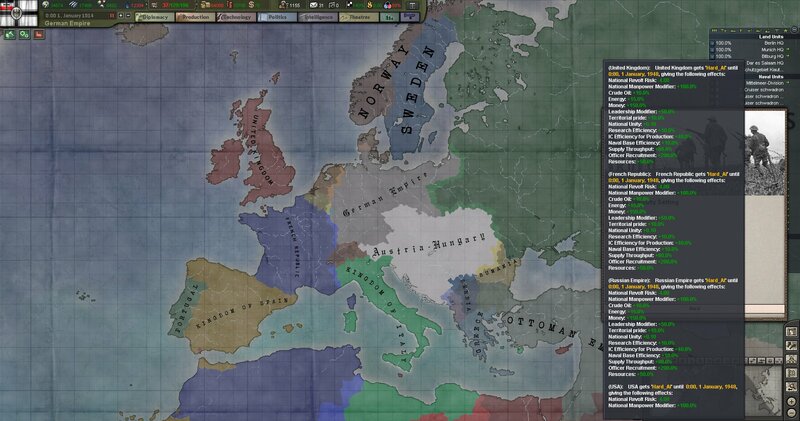 The fighting is taking its toll on the German nation as hundreds of thousands of men are being chewed up and spit out at astonishing speeds. The killing power of artillery and machine guns is proving far greater than what anyone had imagined. A new type of war is developing, an industrial war. 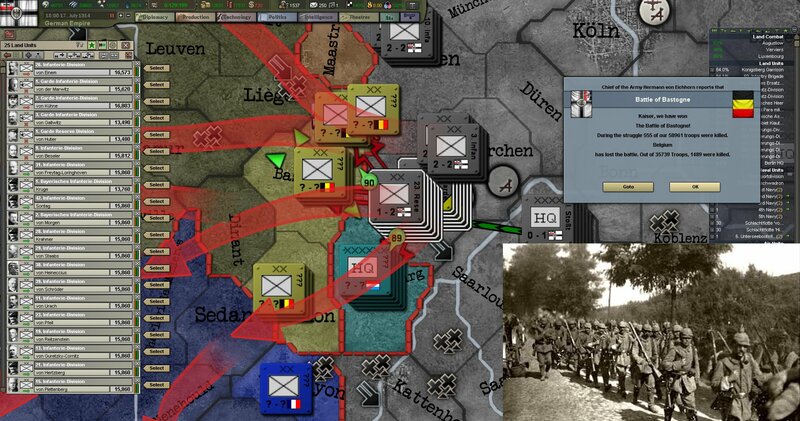 The situation in Elsaß-Lothringen is growing ever more desperate. Von Brodrück, the command of the IV. Armee, tasked with defending Elsaß-Lothringen desperately cries for reinforcements and there are many generals who echo his cries. 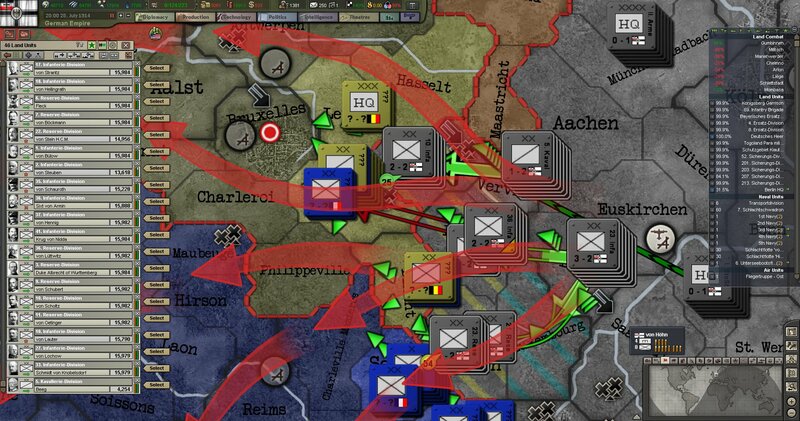 Yet von Moltke holds strong, just like the right wing. Finally some good news arrive from the South. Our Austro-Hungarian friends have finally taken Montenegro. 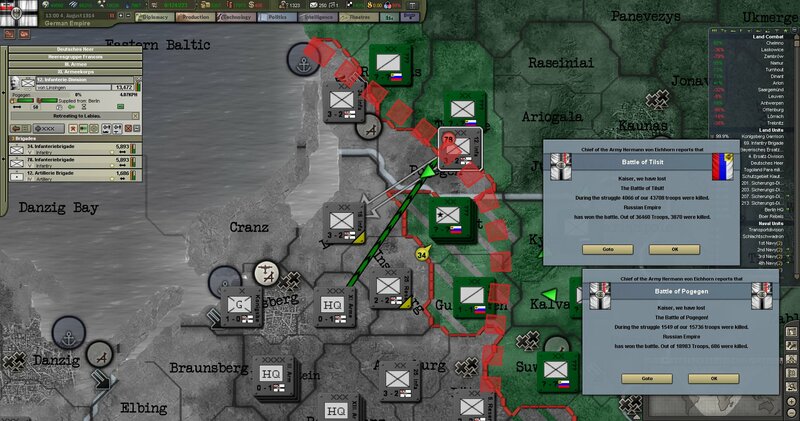 Defense is proving far stronger than the attack as we repel the Russians with heavy loss of life. Even outnumbered 2-1 we inflict double the losses on our enemies. 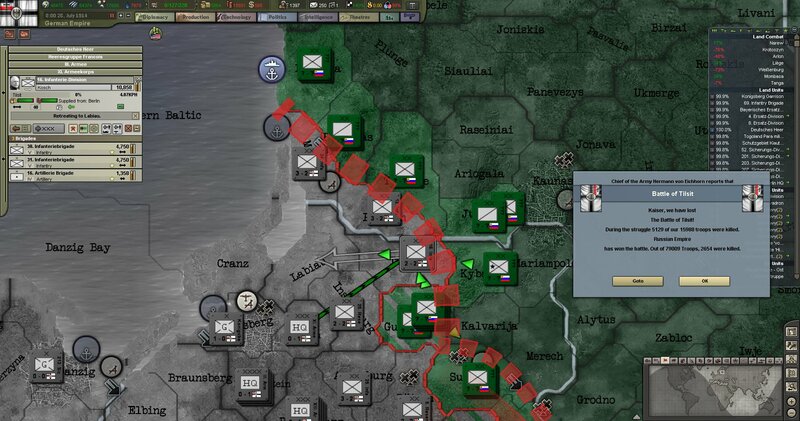 The Russians continue to overextend and die. 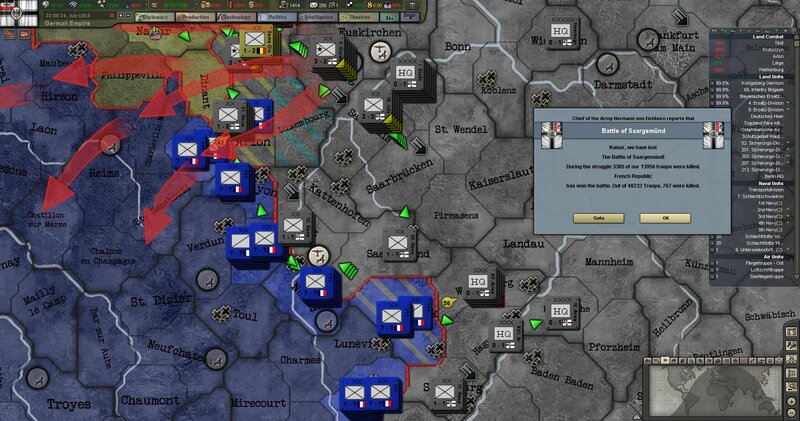 Yet in the west the French strategy of Élan is proving powerful as they rush forward. Machine guns are bombarded with light artillery and then stormed with the bayonet. The colorful sight of the blue and red becomes a common sight for our troops. In the East the Russians are rushing forth even after the victory in the Augustow area. 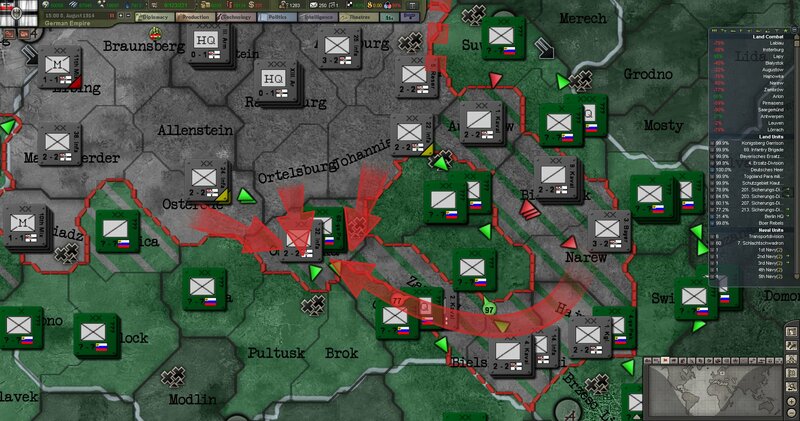 The only hope for the east was the offensive by the Bavarian army corps to cut off the advance of the Russians into Silesia. It also requires the poorly armed and bodied Landwehr to hold out against all odds. Even so the "Advisor" says victory is possible, his final words before setting off on the offensive were "I will make Manstein proud." 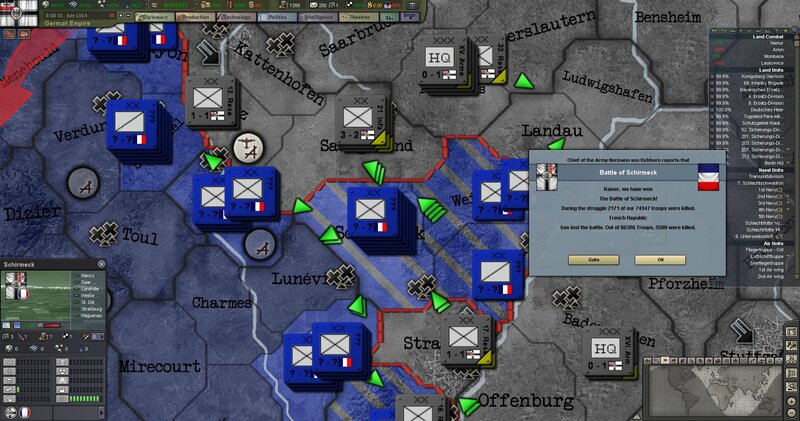 In the west the French are pushing aside our troops as they advance into Germany. They threaten Frankfurt, Straßburg and Stuttgart. 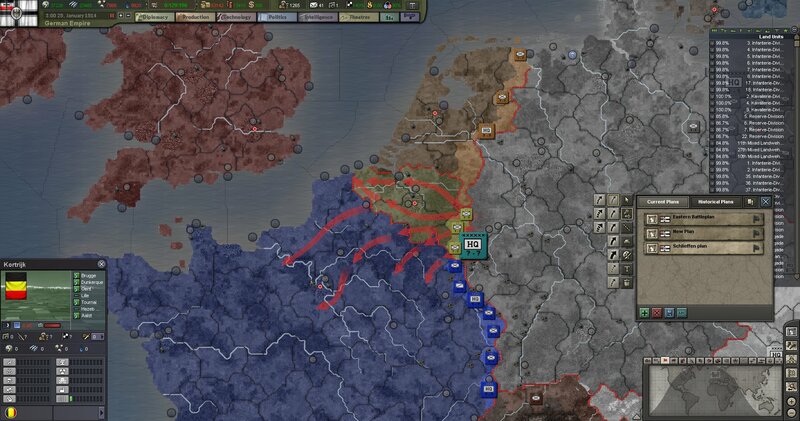 The calls to pull more troops from Belgium trickle in every day. 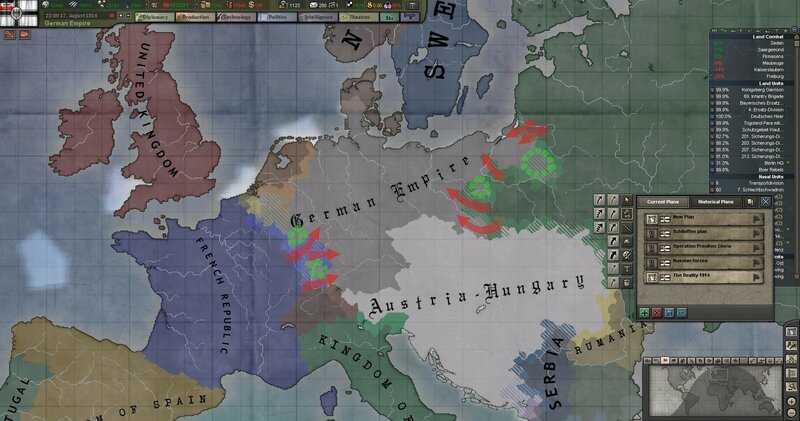 Will Moltke abandon the Schlieffen plan? 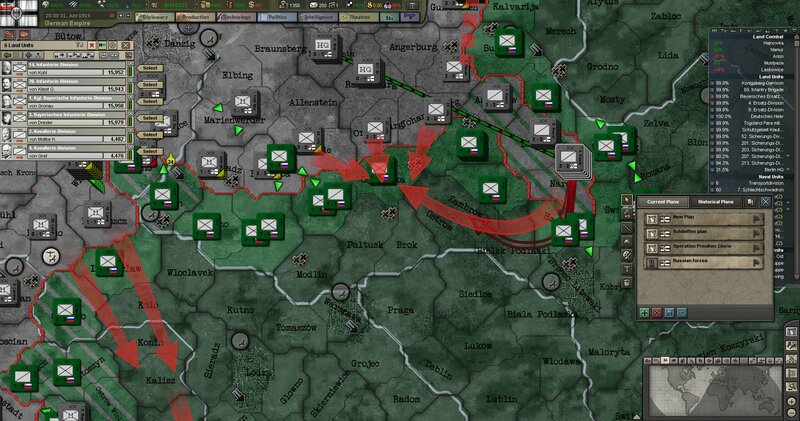 Will the Advisor save the eastern front? 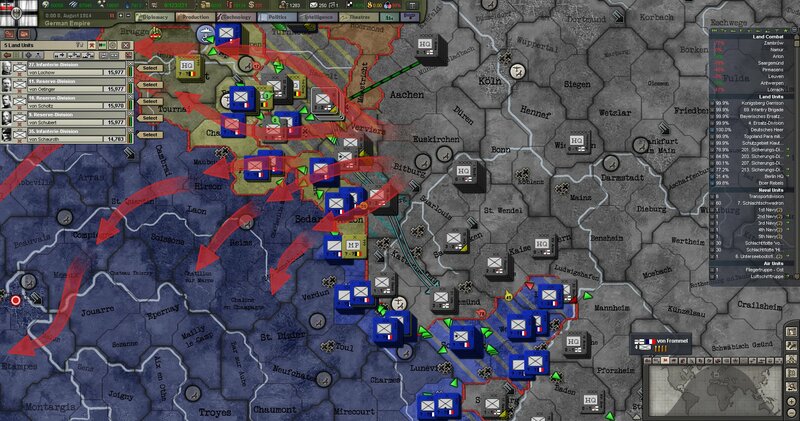 Will the Austrians fall apart? Find out that and more in the next chapter of the Kaiserzeit.